At nursing homes, hospice care centers, and hospitals, activity professionals develop a program of physical, mental, and emotional activities that help stimulate the minds and bodies of residents and patients, as well as improve their overall quality of life. With the help of organizations like yours, here at Positive Promotions we’ve developed inspiring, motivational messages to display on our affordable appreciation gifts, including this year’s new theme, Activity Professionals: Celebrating Life, Touching Hearts, plus our unique I'm An Activity Professional Therefore I… design. Plus, we offer a variety of exclusive themes and stock logos to further compliment your team. From Therapeutic Recreation to Welcoming New Residents, your activity pros are fully dedicated to the well-being of their patients. 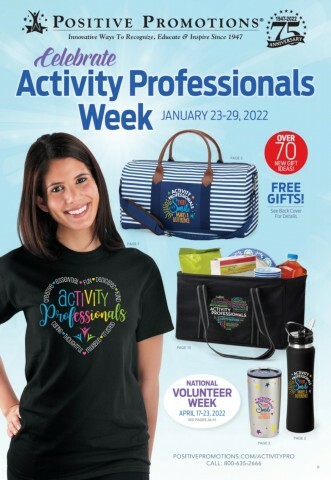 Recognize and thank your staff with custom activity professionals gifts they will use and appreciate every day, including lunch bags, totes, umbrellas, drinkware, and more, all featuring positive motivational messages. You can also choose from money-saving gift sets and gift combos that pair some of our most popular activity pro gift ideas. To let them wear their professional pride during Recreational Therapy meetings or any day, outfit your team with comfortable, colorful apparel that includes short- and long-sleeve T-shirts, lightweight jackets, baseball jerseys, full-zip hooded sweatshirts, and more. Holding an Activity Professionals Week event? Involve everyone in your celebration by displaying our boldly designed, 2-sided Event Poster throughout your facility. Featuring a touching Maya Angelou quote on the back, it's certain to get everyone excited and help make the occasion a success. You'll also find great choices for giveaways and raffle prizes, from comfortable microfleece blankets and desktop caddies to versatile messenger bags and beverage sets. And remember to show appreciation to the valued volunteers who work tirelessly and unselfishly at your facility to help improve others’ lives, during National Volunteer Week or any day of the year. Your activity professionals also help coordinate the hiring, scheduling, and buying for volunteers, making it even more important to recognize the accomplishments of all your team members. Choose from a wide selection of thoughtful volunteer gifts, many displaying our exclusive designs such as Volunteers: Giving Time, Touching Hearts and Volunteers Are There When You Need Them.